You can order Dalat city tour that will take tourists visiting the famous sights in the city. Summer Palace of Emperor Bao Dai. there are three building castles named 1, 2, and 3 palaces. In this complex there is also a golf course that was built in 1922 when the emperor try golf practice the skills he learned while studying in France. Flower gardens surrounding the Vietnamese traditional house made from teak wood. The vineyard is located in the northwest of Xuan Huong Lake. Admission tickets around 10000 Dong. Crazy House is a unfinished fantasy house. Is a must-see attraction when you architecture buff. The building is located in Huynh Thuc Khang in, Phuong 2, about 3 km from Duy Tan Street. The admission price is around 30000 Dong. The pagoda is situated on a hill. There is a cable car that will take you to the top of the hill. A short trip with the cable car through the hills of pine which is a lot of vegetation that grows in Dalat. Lang Biang high mountain offers views of Dalat city and the surrounding mountains and valleys. If the attraction is not satisfactory rating, here are some other attractions that can be visited. Been to Da Lat Market that sells a wide variety of vegetables and fresh fruit. Here you can buy fruit jam to take home. Da Lat Station could be your destination. Here you can ride a steam train through the length of 7 km to Trai Mat and then visit the Linh Phuong Pagoda. Steam train ticket prices around 106,000 Dong. Nha Tho Domaine de Marie is a young red church on the hill. The church is located at Ngo Quyen, about one km from the junction between Ba Trang and Hai Thuong Hai. Here you can buy dried fruit sold the nuns. Xuan Huong Lake certainly will not want to miss. You can freely visit the lake in the city center at any time. If you want, you can also rent a boat. Actually this is an artificial lake built two dams on the river after Camly damaged after a storm. The lake is 5 km diameter into the water reservoir. You may be lucky enough to get accommodation with lake views. Another lake that you can visit are Ho Suoi Vang gold spring or a pristine lake. Thien Vien Truc Lam monastery you can visit the cable car ride. This monastery is situated on a hilltop. From the top, tourists can see a view of the reservoir. In addition, this monastery also has a garden with plants that are shaped like animals. It’s a great place to cool down. Ticket prices for the cable car 50000 Dong. To enter into this monastery, but you are free to make a donation. Bang Lang mountain with the highest peak of 1900 meters. The peak of this mountain can be achieved through the path steep for about 3 hours. You can also use transport rider at a cost of 40000 Dong. Do not forget to visit minority villages at the foot of the mountain. Sigh of sadness lake is located 5 km from the city. The lake is named for the story of two lovers, when a woman committed suicide while his boyfriend called to duty as a soldier. Thung Lung Tinh Yeu or Love valley is located about 5 km from the city, located in Phu Duong Thien Vong. This place is very popular lovers visited. This place is also very suitable to roam the canyon. Pongour Waterfall is located 30 km south of the city. This waterfall is one of the greatest and most wide throughout Vietnam. 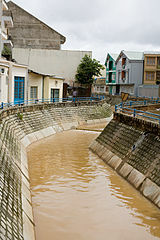 Very beautiful if visited during the rainy season when the water flow is very heavy with a full-filled pool under water. A dam was built nearby to accommodate the swift flow of the waterfall. Prenn waterfall is located in the mountains about 10 miles Prenn outside the city. The place is also ideal for hiking. Tuyen Lam Lake is located 5 km south of the city. This lake contains pure greenish water flowing from springs and from the Da Tam River to the lake through the Voi mountains. This lake is one of the largest and most beautiful. The location is also ideal for hiking. The best way to explore Dalat is to use easy rider. This term refers to use for Xe Om tourists who drove around town Dalat. You can tour a day, 2 to 5 days. Even with the easy rider in you can also explore the many cities in central Vietnam. Of course, different rates depending on the number of days, accommodation, destination, and others. Recommendations Dalat easy rider tour can be found in Dalat Easy Rider Club is located at 66 Truong Cong Dinh, Easy Rider Trip Private Day Tours is located at 1 Nguyen Khuyen, and Easy Riders Vietnam, located in 67 Truong Cong Dinh. Dalat is a favorite for upscale city of Vietnam. Therefore accommodation in the town is largely a luxury hotel or resort. However, there are several options quite cheap hostels with prices like YK Home Villa is located at 09 Yet Kieu and Villa Pink House is located at 7 Hai Thuong.